They: Did you go shopping for the blizzard? They: Why not? It’s supposed to be a serious storm. Me: I buy food every week, and have a pantry that’s probably good for two months. Why do I need to buy more food? They: In case the power goes out! Me: [Gives gas face] And—what will that do to all that milk you just bought? The prevailing NYC raid-the-supermarkets groupthink over a few inches of snow has been on my mind to rap about, but Vice’s Munchies blog captured plenty of my thoughts. Bless those cats. I dropped by a store today to get a wedge of cheese for a dish I was craving to make, and it slipped my mind for a moment that my neighbors were on that Little House on the Prairie BS. My cheese was likely one of the few food items left on the shelves. But I left the cheese and walked out—not a fan of long-azz cashier lines. 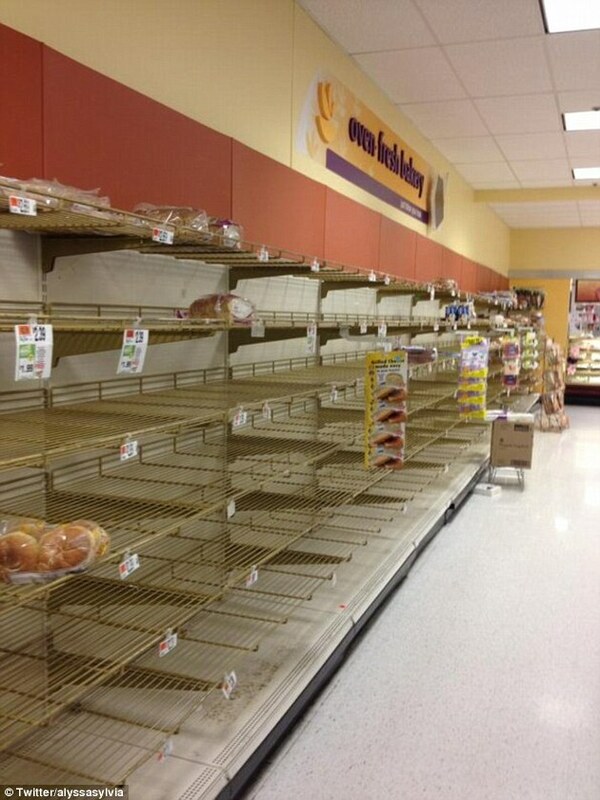 (Laughing) And wassup with buying all this damn bread to prepare for a snowstorm? Didn’t you people have enough of long lines after Black Friday? Let’s assume THE snowstorm to turn back civilization by a century hits New York City tonight. How in the hell will four loaves of bread help your family to survive? My suspicion is that Bamas are so locked into dine-out and order-in modes where buying groceries—and possibly even preparing food—are their versions of living off a survival instinct. I had a phone convo with one of my friends, who thinks all this blizzard-hoarding gives people a sense of adventure, since they don’t have much else happening in their lives. Anyway, relax peeps. The food supply chain—for good or evil purposes—is not permanently broken in this case, and you’ll likely see more bread in a day or two. This entry was posted in Food, Silly, Society and tagged blizzard, Food, food chain, grocery, munchies, New York, NYC, retail, Silly, snowmageddon, snowpocalypse, supermarket. Bookmark the permalink. try working in it, my friend. oh heavenly mother of god. dead dying done, mentalunrest. shoot me i quit. back at it again tonight. and tomorrow. and the next day. the ever-loving story of my ever-loving life. this agony, it ain’t worth $8.50 an hour! I’ll definitely keep an eye on it!